African Daisy : JimiArt!, excite your soul with art! 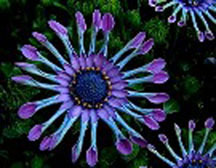 The "African Daisy" is a rare and beautiful flower found in remote areas of Africa. The colors are brilliant and it is truely one of a kind.